This term time journal will help you keep track of classes, lectures or to-do lists or even act as a diary for recording memories and thoughts. There are even two pockets to keep hold of library passes, tickets, photos or anything else that needs to be close to hand or kept as a memento! Bound with bulldog clips, pages can be added or removed and the pages can be personalised as you go, meaning this planner can grow as the term progresses. 1. Trim a piece of card to 9.5cm x 14.5 cm and place in the bottom right hand corner of a 12x12 album pocket. Heat the fuse tool with the scoring end attached. Making sure the pocket is on a glass mat or heat proof mat position the ruler to fuse a pocket slightly larger than the piece of card. Repeat at the bottom of the pocket. Repeat at the top right corner. 2. Allow the fuse tool to cool. Remove the fuse wheel tip and replace with the cut tip. Measure a point 2.5cm to the left of the vertical fuse lines and use the metal guide to cut vertically from this point to create each pocket with a tab to the left. Repeat the cutting motion below the bottom fused edge of each pocket. 3. Trim six different pages from the Paper Addicts Let’s Flamingle paper pad to 12.5 x 15.2cm. This will give a front and back cover and four monthly dividers. Bear in mind that some of the papers have lines or squares which you could use to record activities each month, so make sure you cut them in the correct orientation. 4. Cut four strips of paper from the pad to 14.2cm x 3.7cm to form the monthly dividers. 5. Use double sided tape to fix each tab to the divider cover. Lay one on top of the previous month to make sure they are spaced out evenly and the tabs line up. 6. Fix a piece of adhesive sheet to the reverse of the yellow patterned paper from the Flamingoals pad. Die cut the letters to represent the four months of the Autumn term and fix them to each of the four tabs – Sep/Oct/Nov and Dec. Add a sticker from the Dovecraft sticker pad to each tab to decorate. 7. Run a line of washi tape horizontally and vertically along the cover and add alphabet stickers to spell out ‘Autumn Term 2018’. Add a flower sticker to the left corner. 8. Cut white copier paper to 12.5 x 15.2cm to create 25 sheets. 9. Compile the planner as follows: Front cover, one plastic pocket, five sheets of paper, September divider, five sheets of paper, October divider, five sheets of paper, November divider, five sheets of paper, December divider, five sheets of paper, plastic pocket, and finally, the back cover. 10. Use bulldog clips to hold the pages together so that you can add or remove pages as needs be. 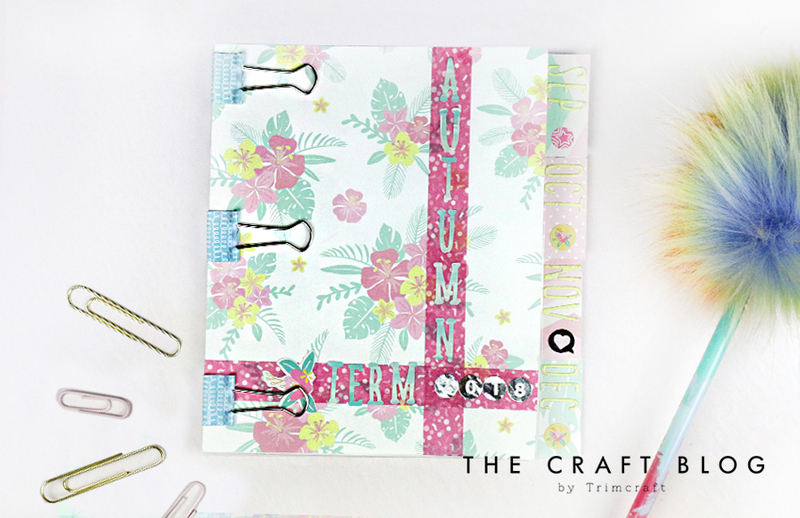 We hope that this tutorial has inspired you to create your own Autumn Term Planner! We’d love to know if you give this a try, so don’t forget to tag @kathycraftstv and to #Trimcraft when uploading to social media and to share you projects in the Inspiration area.